Pickup and delivery for grooming may be available in your area. Contact us. Brightly lit, sparkling clean, comfy bathing stalls complete with dryer, towel and apron for washing your pooch yourself. We have a variety of environmentally safe, hypoallergenic and healthy bathing products available to enhance the experience for you and your dog. Our Hydrosurge bathing unit is perfect if your pet has sensitive skin or arthritis. 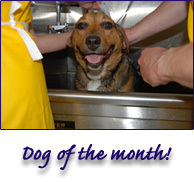 Professional grooming and bathing includes teeth, nails, ears and glands for dogs and cats. We’ll send your pet home clean and stylish. Carefully selected healthy food for your pets including dry, canned, grain free, organic and raw. Chewing and fetching toys for dogs, feathers and catnip for cats, beds for comfy naps and treats for all of your furry friends. Much too many products to list here, so contact us or stop by and visit. We love our pets and know that you love yours. Your pets are like ours while they are here for bathing and grooming, and would only sell products that we feel confident would be good for your dog or cat. Conveniently located at Lake Montebello and near Herring Run Park in Baltimore City, home of the best dog walks in town. We are a short drive from most neighborhoods.